There are two Grays on Datchet’s WWI Memorial, cousins Frederick Charles Gray and William George Gray. 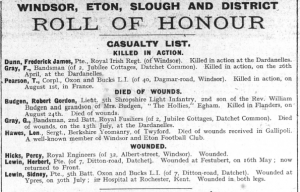 These men were both in the Royal Fusiliers and were both linked to 2 Jubilee Cottages on Horton Road where their aunt, Miriam Phyllis Gray, lived. 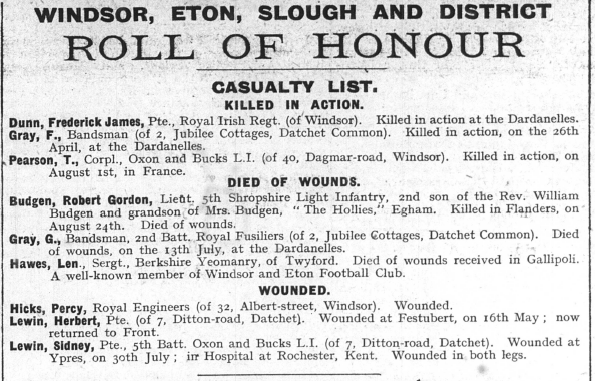 William George Gray is one of the older soldiers listed on Datchet’s WWI memorial. He was born c1868 at Bishopsgate, adjacent to the Great Park near Englefield Green. Young William George was known as George, perhaps to differentiate him from his father William Charles. In the 1871 census at Bishopsgate, three-year-old George was with his parents, William, 24, from Winkfield and Hannah, 36, from Chalfont St Peter, and two younger siblings, Louisa, 2, and Henry, 1. The family continued to grow and, over the next few years, two more children were born at Bishopsgate, John Charles in 1872 and Arthur Robert in 1873. Their mother, Hannah, died in 1877 leaving five children under 10. By the next census in 1881, the Grays were at Crown Cottage, Windsor. Father William was working as a park labourer. He had remarried in late 1877 and the children had a stepmother, Eliza Quelch from Clewer Green, born c1851. The five children from the first marriage were at home, and William and Eliza had had another child, Eliza Mary born in 1879, whose birth had been registered in Windsor. 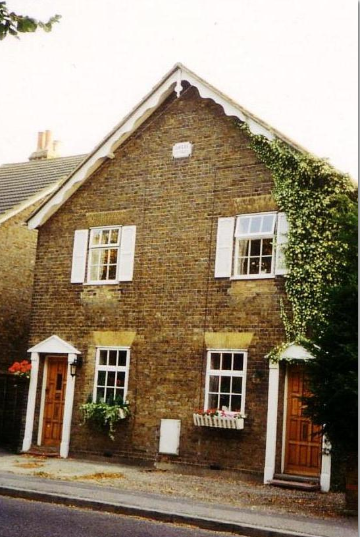 By the 1891 census, the family was living at Parkside Cottages, Egham. Father William was working as a foreman at a nursery and brothers Henry and John were labourers in the Great Park. William and Eliza had had four more children, Fanny, born 1882, Richard, born 1885, David, born 1888, and Edward, born 1890. George was not with them on the night of this census, and hasn’t yet been found in the 1891 census. He was perhaps working away from home. On 15 July 1899, George married Ellen Elizabeth Waller from Egham Wick at Christ Church, Virginia Water. Their marriage certificate records that George was working as a gardener, like his father, and Ellen was a labourer’s daughter. George’s sister, Eliza Mary, was one of the witnesses. In 1901 George, aged 33, was working as a labourer. He and Ellen were living in a cottage at Egham Wick with Ellen’s mother, Elizabeth, aged 76, from Bagshot. Elizabeth died not long after the census. Sadly she didn’t get to meet her granddaughter, Annie Elizabeth Gray, born to George and Ellen c1902. In 1911, they were still at Egham Wick. The census recorded that George and Ellen had been married for 11 years, and had had two children but lost one. William was working as a carter in the Crown Woods and Forest. By the time war broke out, George would have been in his mid-forties. He enlisted at Hounslow, as had his younger cousin Fred Gray. George became Bandsman L/12016 in the 2nd Battalion of the Royal Fusiliers, 86th Infantry Brigade, 29th Division. George and Fred were in the same Battalion but we don’t know if they served in the same Company. As yet, we do not know the date George enlisted. At the outbreak of war the 2nd Battalion was in India. They did not embark for England until December 1914 and were then stationed at Stockingford in Warwickshire. They were mobilised on 19 January 1915, receiving orders that suggested they were headed for an eastern destination rather than the Western Front. 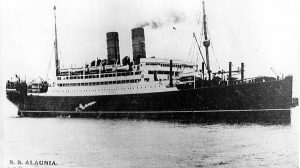 The Division was inspected by the King near Dunchurch on 12 March 1915 and four days later the 2nd Battalion embarked on SS Alaunia at Avonmouth, near Bristol. 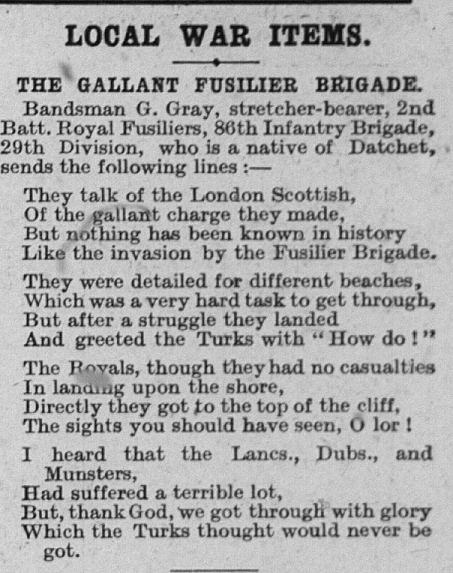 ‘The 2nd Battalion had written a memorable page in one of the most tragic episodes of the war. Landing on the Gallipoli Peninsula with the 29th Division on 25 April, they saw the campaign through to its close in brilliant failure. ‘Alaunia steamed her stately way through beautiful weather to the Eastern Mediterranean. When she was still some distance from Gibraltar the navy began its attack on the Dardanelles Narrows. But apparently there was no advantage in speed and the division waited a few days at Malta. 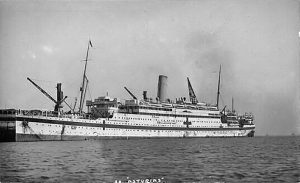 Alaunia then steamed towards Lemnos until the night of the 26 March, when she received orders to change her course and at length arrived at the Egyptian city of Alexandria on Palm Sunday, 28 March 28, about noon. The troops did not disembark until the following day when they proceeded to Mex Camp. The routine of the next few days outlined the task which the battalion was to undertake. There were practice disembarkations with subsequent attacks on enemy positions. One of the Lancashire Fusiliers attempted to relieve the tedium by almost drowning himself while bathing in a rough sea, but Lieutenant Anstice, who added a happy zest for life to a facility for finding adventures, very bravely rescued him. ‘The routine became a little more strenuous and life-like after the battalion finally reached Lemnos on 11 April. The mere operation of disembarkation as carried on in some of these rehearsals was the reverse of inspiriting. The vessel stood high out of the water and to enter a boat, bobbing up and down in the water, by means of a rope ladder was like leaving the roof of a sky-scraper by means of a spider’s web leading to a cockle-shell. Fortunately the operation was simplified for the landing on the peninsula. HMS Implacable did not stand nearly so high out of the water and wooden ladders were let down to the boats. 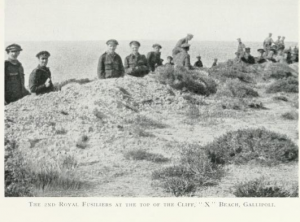 ‘On the evening of the 23 April, the 2nd Royal Fusiliers left Lemnos with the covering force and headed for Tenedos where the last preparations were carried out. 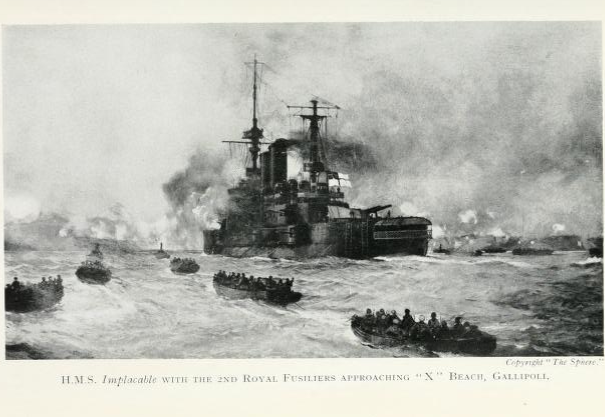 There the battalion was split: W and X Companies with headquarters, went on board HMS Implacable about 7pm on the 24th while Y and Z went on board a mine-sweeper. About 10.30pm the approach to Gallipoli began. The night was calm and clear, and the short journey was made under a brilliant moon. The two companies on Implacable had a hot breakfast about 3.30am (25 April) and the men were then put into boats. The moon had already set and the night had become dark and still. At 4.45am the fleet bombardment began and after about half an hour later, Implacable steamed in until her anchor, hanging over the bows to six fathoms, dragged. On each side of her were two tows of six boats. ‘The difficulty of the task which these heroic troops were about to undertake is now commonly realised but at the time, the objective visualised for the covering force shows no appreciation of it. This objective, ‘the ridge across the peninsula, point 344, Achi Baba peak – 472 – coast line’, remained to the end an unrealised dream. The Turks had had full warning and had prepared for the reception of their uninvited guests with a defence built upon their own unquestioned courage and the conscientious organisation of their German allies. ‘The landing place of the 2nd Battalion was a small natural amphitheatre with a narrow floor of sand about 200 yards long, lying on the north-west face of the peninsula. The cliff was some 100-feet high, rising somewhat steeply from the beach and there was no natural way up. The boats were towed in by the pinnaces to about 100 yards from the beach, when, cast off, they had to look to themselves. Each boat had a midshipman and two blue-jackets, who were to take them to the mine-sweeper when the first half of the battalion had landed. 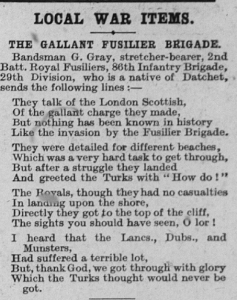 That was the extent of the Battalion’s success that day. In his book, O’Neill relates the tragic fate of each Company in turn. 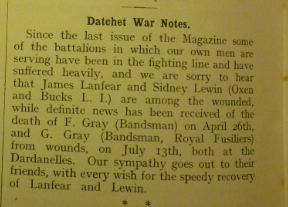 The losses of the 2nd Battalion were very heavy and it was reduced to half strength. Bandsman George was described as a stretcher bearer. Bandsmen were often stretcher-bearers; they had the hazardous task of recovering the dead and injured from the battlefield, often under fire, carrying only basic medical equipment such as bandages and morphine. In the introduction, George is described as a ‘native’ of Datchet. This seems odd as George always gave his place of birth as Bishopsgate. Perhaps he sent the poem to his Aunts Miriam and Emily in Datchet and they passed it to the newspaper? Alternatively, there was possibly some confusion with another man, George William Gray, who was born in the village who was a sergeant-drummer in the Royal Fusiliers. By the time this poem was published, George had also died. 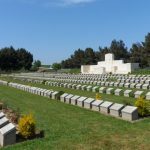 He was wounded in action and died of his wounds at sea on 13 July 1915, two days before the 2nd Battalion left Gallipoli and embarked for Lemnos. 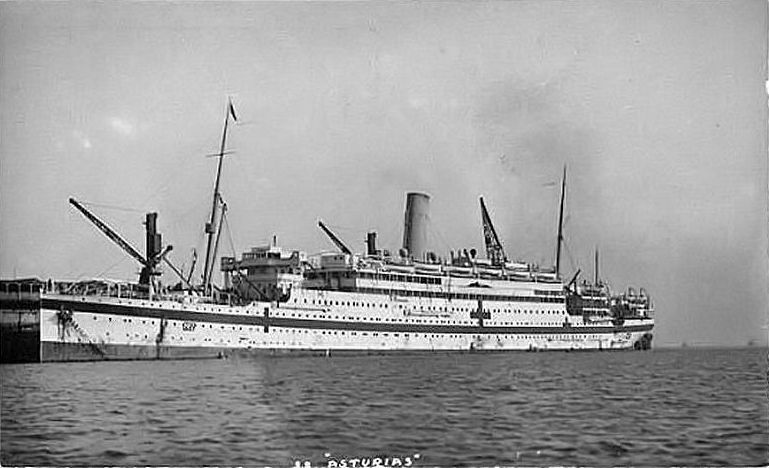 He died aboard HMHS Asturias, a hospital ship. 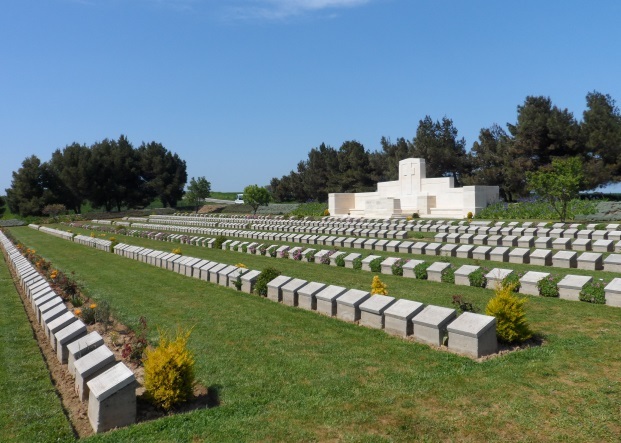 George was buried in the Lancashire Landing Cemetery, Gallipoli. He was awarded the Victory and British War Medals and the 15 Star. His ‘Soldiers Effects’ document indicated that his sole legatee was his Aunt Emily who was living with his Aunt Miriam at 2 Jubilee Cottages. Emily was about four years younger than George. It is not yet understood why there is no mention of George’s wife and daughter in his military records. 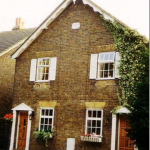 Both George and his cousin Fred gave their address as 2 Jubilee Cottages, Datchet, the home of their aunt, Miriam Phyllis Gray (1844-1926). Miriam was born in Winkfield. She was the sister of George’s father, William Charles, and Fred’s father, Albert. She also had a much younger sister, Emily, born in 1864. In the 1871 census her family was living in a cottage at Wheeler’s Yard, in the Royal Village in the Great Park. The adjacent households included the gamekeeper’s house, the Royal School, carpenters, workshops and other cottages. This suggests they were employed by the estate. In that census, 27-year-old Miriam was still living at home and was described as a thistle picker. This employment, at such a late age, suggests that she perhaps had a low IQ or learning difficulties of some kind. In the 1881 census, at the age of 37, she was still with her parents at Wheeler’s Yard. In the following censuses, 1891, 1901 and 1911, Miriam was living at Jubilee Cottages with her sister, Emily. There was a 20-year age gap between the two women and Miriam is sometimes recorded as widowed, other times single. Emily is similarly recorded as either her sister or her daughter. Both were working as laundresses. Between October and December 1893 Emily married George James Cheeseman. Their marriage was registered in Eton in the same quarter as the birth of their child, Emily Midiam (sic) G C Gray. Mr Cheeseman wasn’t with them for the 1901 or 1911 census, and by 1911, Emily and her daughter were using the surname Gray. Jubilee Cottages (number 2 is on the right of the photograph) were substantial modern houses built in 1887, the year of Queen Victoria’s Golden Jubilee, so Miriam and Emily must have moved in soon after they were built. They sometimes had a relative or lodger living with them but it’s not yet undertood how they were able to pay the rent on their wages as laundresses. The 1910 rate valuation confirms that Miriam was the occupier and it was owned by a Mr J Dean of Chelsea who had no other property in the village. It was at a time when whole blocks were often bought and sold by absentee landlords or local developers.